An unidentified 50 year old man was found dead this morning on subway tracks at the Essex Street station on the J, M, & Z trains. MTA employees spotted the unconscious man laying on the ground & alerted police. 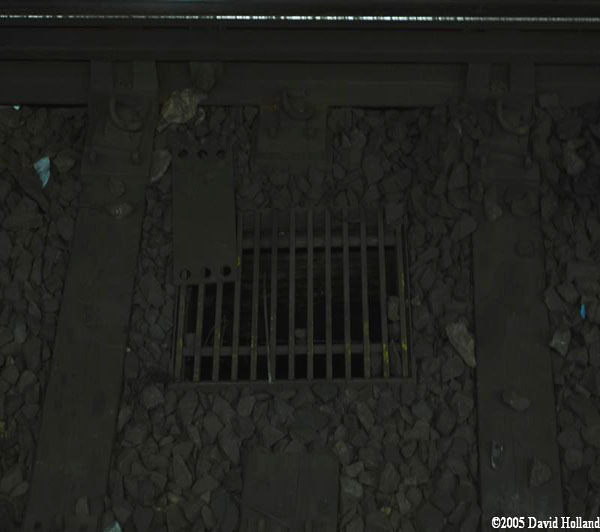 When the police arrived, they found the man laying on the tracks with his feet touching the third rail. The victim was pronounced dead an hour later. My question is how did the man go from laying on the ground which I assume was the platform down to laying on the tracks touching the third rail? I assume the cops came a short time after being called so how did all of this take place? Did any of the workers not try to wake the man up? Why was the man not watched while the cops were on their way? Either the events of this story were incorrectly reported or the scene was mismanaged. The homeless man known to some as the Caveman, was sleeping in his usual spot at the foot of the Williamsburg bridge. He was not visible because his body was in a niche where he slept. I’m told his naked foot touched the third rail while he slept. It is unfortunate, but I do not believe he suffered in death. May he rest in peace. I recognize you from SubwayBlogger. Thanks for visiting & leaving a comment. I also want to thank you for sharing information about this story. I agree with you in that I hope the man rests in peace. I hope he is better off as no one deserves to live anywhere in the subway.